The man who once described Bitcoin as “a fraud” that is “worse than tulip bulbs” has taken his first bite of humble pie and is eyeing up another slice. JP Morgan’s CEO Jamie Dimon has turned around on his dark view of the world’s biggest crypto and is starting to eat his words after the recent explosion of cryptocurrencies across the board, Bitcoin leading the pack. Yet, Dimon noted in a FOX Business interview on Tuesday that not only does he “regret calling Bitcoin a fraud”, but he admits that blockchain is real- (thanks Jamie, we needed that). When it comes to bashing Bitcoin, he hasn’t done a complete U-turn, however. 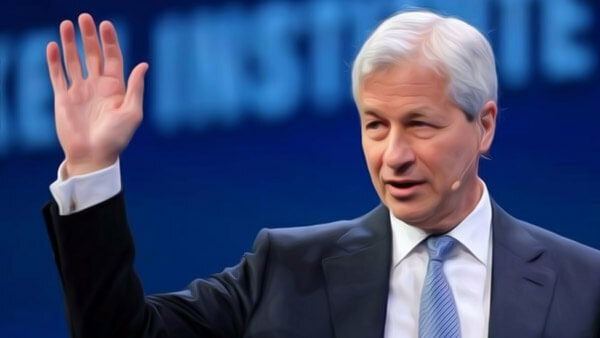 While he cannot deny the success of Bitcoin and blockchain any longer, Dimon expresses he is just not interested in cryptocurrencies. It pays to take any statement by a large financial corporation with a grain of salt, mind you. While Dimon is an undisputed kingpin in the banking world, his statements on cryptos highlight some colossal gaps in his understanding of the technology and its place in the future of the world. Misinformation is highly damaging to the cryptocurrency market because of the number of amateur investors that can be scared into selling by a single comment. The fact that players like Dimon are some of the biggest voices for the public right now is gravely concerning- when the mainstream media should be giving equal (if not more) exposure to leading industry experts. For one, claiming that a cryptocurrency can be “closed” is enough to make anyone who understands blockchain laugh out loud — this is why his comments are largely dismissed by blockchain advocates. Yes, cryptocurrencies will invariably face regulation in the future, but “closing” one would require every single node in existence to be shut down- namely requiring a collaborative effort between every government on the planet. Last year, new crypto wallet startup Eidoo trolled Jamie Dimon with a full-page Wall Street Journal advertisement reported to cost upwards of $300,000. Given that most nations can’t unite over much more pressing affairs (climate change, for example), a global attempt to take down cryptocurrencies looks highly unlikely, to say the least. This whole debacle has highlighted an enormous divide in knowledge surrounding cryptocurrency. While the mainstream media largely understand it as a financial revolution, in reality this is just the tip of the iceberg. Their innovative technology explains the value of their token surging nearly 40,000% since their inception. This is why Dimon is ultimately unqualified to offer predictions as to the future of Bitcoin or cryptocurrency, unless he can prove he understands their usage case and offer a valid counter-argument. While fraudulent coins and abandoned coins are plentiful, saying they are all bad eggs is much like saying every email you receive is a scam. Ironically, we could say much the same for statements about cryptocurrency. Some come from informed, credited sources, while many speculate with wild claims that are unfounded or even the opinions of those who stand to lose out should they succeed — namely large banking institutions like JP Morgan.